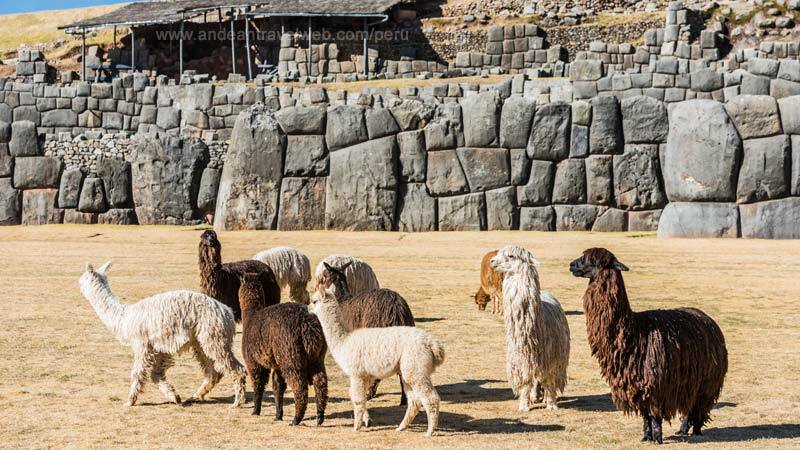 The Inca ruins of Sacsayhuaman, Q'enko, Puca Pucara and Tambomachay are situated quite close by to Cusco and can easily be visited in half a day, either independently or part of an organized tour. 1) The first is to take a bus from Cusco on its way to Pisac and get off at the furthest ruin Puca Pucara. After visiting this Inca hillfort you can cross the road to visit Tambomachay and then walk back along the road to Q'enko and Sacsayhuaman. In the valley immediately to the left of the huge Inca stones of Sacsayhuaman you'll find a small path leading down to Cusco. (total walking distance about 8km). Instead of the hassle of catching a local bus you could take a taxi to Puca Pucara for about $6-10. 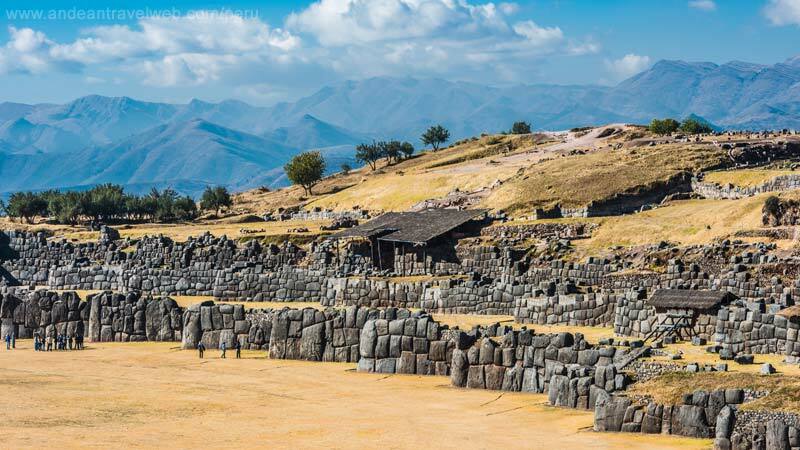 2) Alternatively you could walk up to Sacsayhuaman. From the Plaza de Armas just climb the steep street of Resbalosa, past the church of San Cristobal and follow the well marked path up to the ruins at the hairpin bend in the road. If you head to the left of the huge white statue of Christ on the hill overlooking the city you won't go too far wrong. It takes about 40 minutes from the Plaza and it's a good test to see if you have acclimatized and are fit to undertake the more difficult treks such as the Inca Trail. From Sacsayhuaman you can hire a horse and a horseman to take you on a round trip of the other ruins (3-4 hours). The cost of hiring the horses depends on how many there are of you (and how rich you look), but 2 horses plus a horseman to show you the route should work out at about $6 per person. Visitors to this magnificent Inca fortress, which overlooks the city of Cusco, cannot fail to be impressed by the beauty and monumental scale of this important Inca construction. Sacsayhuaman can be variously translated as 'speckled falcon' or 'speckled head'. The last interpretation refers to the belief that the city of Cusco was set out in the form of a puma whose head was the hill of Sacsayhuaman. The origins are uncertain but the fortress is generally attributed to the period of Inca Pachacuti, the man who essentially founded the Inca empire. The main ramparts consist of three massive parallel walls zigzagging together for some 400m, designed to make any attacker expose his flanks. The massive blocks, the largest being 8.5m high and weighing nearly 300 tonnes, are fitted together with absolute perfection. The foundations are made of Yucay limestone brought from over 15km away. The outer walls are made from massive diorite blocks from nearby, and the inner buildings and towers are made from dark andesite some of it brought from over 35km away. With only natural fibre ropes, stone hammers and bronze chisels it must have been an enormous task. The chronicler Cieza de Leon, writing in the 1550's, thought that some 20,000 men had been involved in its construction: 4000 men cutting blocks from the quarries; 6000 dragging them on rollers to the site; and another 10,000 working on finishing and fitting them into position. According to legend, some 3000 lives were lost when one huge stone that was being dragged uphill broke free. 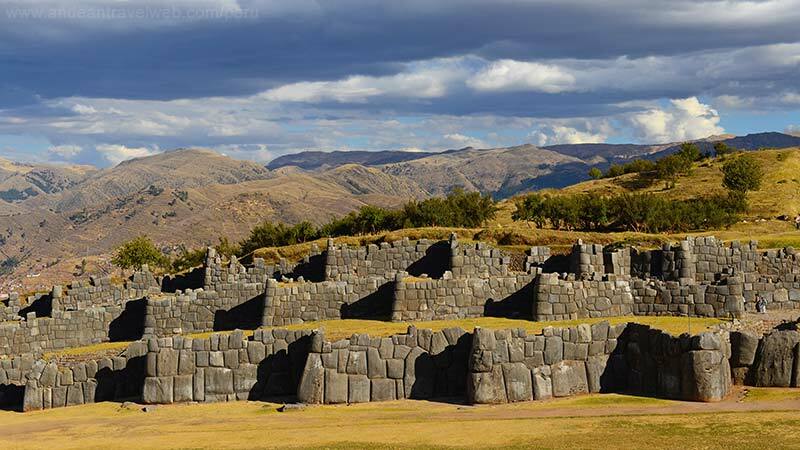 Sacsayhuaman played an important part in the final defeat of the Inca Empire by the Spanish. Pizarro's party entered Cusco unopposed in 1533 and lived there securely for more than two years before finally being caught unprepared by the rebellion of Manco Inca in 1536. This is one of the finest examples of a rock artfully carved insitu showing complex patterns of steps, seats, geometric reliefs and a puma design. The rock is an excellent example of the Inca 'Rock Worship'. In Inca cosmological beliefs the Incas held large rocky outcrops in reverence, as if they possessed some hidden spiritual force. On top of the rock are zigzag channels which served to course chicha (local maize beer) or sacrificed llama blood for purposes of divination; the speed and route of the liquid, in conjunction with the patterns made in the rock, gave the answers to the priest's invocations. Commonly referred to as the 'Banos del Inca' or Inca baths, Tambomachay was a site for ritual bathing. The excellent quality of the stonework suggests that its use was restricted to the higher nobility, who maybe only used the baths on ceremonial occasions. The ruins basically consist of 3 tired platforms. The top one holds four trapezoidal niches that perhaps were used as seats; on the next level an underground spring emerges directly from a hole at the base of the stonework and from here cascades down to the bottom platform, creating a cold shower just high enough for an Inca to stand under. On this platform the spring water splits into two channels, both pouring the last metre down to ground level.